AIDS activists took to the D.C. streets on Saturday, Nov. 3, to raise awareness about D.C.'s disproportionately high HIV/AIDS infection rate and to motivate their fellow community members — as well as the city's policy-makers — to take action now. 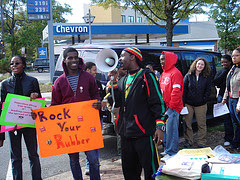 Organized by the Metropolitan Washington Public Health Association, the neighborhood march and community speak-out highlighted the city's continuing HIV epidemic in which as many as one in 20 residents are HIV positive. For more information, visit MWPHA.